ToeJam & Earl are coming back, and I had a chance to go hands on with the most recent build at PAX West. Fans of the originals will be pleased to know that jumping back in feels natural, and while the graphics have been updated, the humor, feel, and fun are still the same. 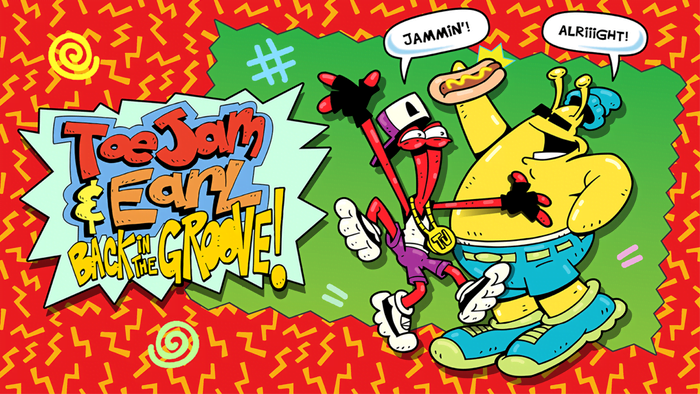 Before my gameplay session, I had the opportunity to sit down with Nathan Shorts, art lead for ToeJam & Earl: Back in the Groove, and discuss the game’s development, and what brought about the revitalization of this retro series. Why ToeJam & Earl? Why go back? Nathan Shorts [NS]: The original creator, Greg Johnson, our designer, he saw on Gamespot some article saying: Now is the time for a new ToeJam & Earl. He said ok, we started developing the prototype, took it to Kickstarter, got funded there, joined up with Adult Swim for a while and now we’re really close to release. Rogue-likes are very in right now and ToeJam & Earl was one of the first in many ways, not only as a rogue-like, but also as a co-op rogue-like. It’s interesting, because it doesn’t do a lot of the things rogue-likes do now, and so it actually works because it stands apart from the others. We felt like the only way to do the characters justice and the fan base justice was to capture the ideal memory of what it was like to play that game. A lot of that is just the bizarreness of it, the weird surprises you find along the way, where usually rogue-likes today, there’s a certain level of expectation for what you get and we threw all expectations out the window. We really wanted to capture that core experience and improve upon it. For example, back in the Genesis days, there was perma-death, there was all sorts of things that just made it so much harder. One of the things we heard from a lot of our Kickstarter backers was that it was a bonding experience for them and their brothers/sisters or their mother/dad. It was a family experience, so we wanted to make sure that you could get the difficulty you’d expect from ToeJam & Earl, but you can also get the family-friendly, player-friendly experience. It’s interesting to see more and more games going back to the harder difficulties these days, like Cuphead just not giving players an option initially. NS: Yeah, we actually just had a closed beta a month and a half ago, and that was something we heard from our players. They said “This isn’t hard enough. Hard mode isn’t hard enough.” So we said, ok we’ll give you a hard mode, but we kept the lower modes pretty manageable for new players. What did you do to ramp up the hard mode? NS: We have things that weren’t in the first game. For example, in hard mode, we’ve added amped versions of the Earthlings [the enemies]. One of the classic Earthlings from the first game is The Boogie, we have a mutated boogie now. It has way more damage, aggros far quicker. We basically take all the sliders of the characters and just crank it up. One of the hardest Earthlings in the first game, the ice cream truck, was a one-hit kill. We now call it the devil ice cream truck, it’s got flames, looks really cool, but on top of being a one-hit KO, it also drops moldy cabbage, which are like little landmines everywhere. It multiplies the difficulty exponentially. It was fun to think that way for a while, because ToeJam & Earl is classically a very chill game, it’s not too hard, but it does have its difficulty. When people asked for hard mode to be hard, it was a fun time. We’ve talked a lot about how the new ToeJam & Earl is similar to its predecessor. What makes it different? NS: We did want to modernize it in some ways to make the modern player feel more comfortable and feel at home. So, we’ve added some persistence to the game. Every time you beat the game, we’re giving you something called a Power Hat. You get to choose from three and we have twenty total. When you start a new game, every level you hit, you’re asked if you want to put on a power hat and from your collection, it puts one on you at random. That alters how the game works. One of them that we really like is called The Hat of Panic, it makes you run faster, but it will also make you go crazy sporadically, so you can’t control what happens. Everything we do is a balance. We also have a new RPG stat system, so whenever you level up in the game, before you couldn’t tell how it would affect your speed or your inventory. Now you can see that right when you level up every time. Each character has different stats that will change how you want to play. Finally, what’s your favorite enemy in the game so far? NS: Gosh, I think it’s probably the clipboard person. It’s one of those clipboard canvassers. Their voiceover currently is just ‘blah, blah, blah’ and then you fall asleep. There’s also the Segway guard, who is just a pudgy guard on a Segway that flattens you. There’s a lot of good ones. One of the things we really value about having a direct communication with backers from the Kickstarter is they gave us all sorts of ideas for what they want to see for Earthlings. We did use quite a lot of them. When are you planning on releasing? NS: Our estimated window is November. We don’t have an official release yet, but that’s what we’re aiming for. We are definitely releasing on PC, Mac, Linux, PS4 and Switch, and Xbox one will come at a later time. We also just announced that we’re doing Switch and PS4 physical release with a limited run. We’re really excited for that! After our interview, I had some time to go hands-on with the game, playing couch-coop with Nathan. I’m happy to report, that the game is just as awesome as he says it is. For fans of the series, it feels like jumping right back in, and for newcomers, it will be an easy game to pick up and play. Thanks again to Nathan for the interview and for showing off the game! ToeJam and Earl releases this November on PC, Mac, Linux, PS4 and Switch, with an Xbox version coming later.